National Organization for Marriage - the ultra right wing fundamentalist group that is dedicated to opposing equality for LGBT couples - lately has been on a "Summer for Marriage" tour. Well, the tours haven't been too successful. Think Progress published an anecdotal report that in Indianapolis, IN, for example, only 40 supporters showed up, compared to about 250 marriage equality supporters. 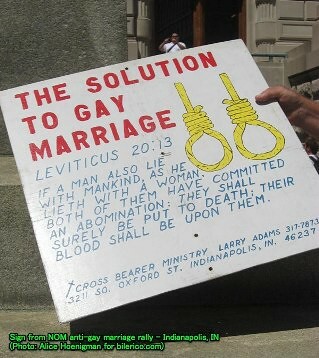 This was one of the signs that was carried by a NOM supporter in Indianapolis. The pictures of this sign and the supporter that brought it is all over the web: on Think Progress, on Daily Kos, The Bilerico Project, The Dallas Voice, and elsewhere. Yet, to this point, there has been no response -- let alone repudiation -- from NOM. Certainly none of the organizers at the rally had the courage to ask the supporter to take that sign down. Without a statement of strong condemnation and apology (for not calling out the supporter and asking to take the sign down), there is no choice but to believe that the National Organization for Marriage agrees with views to execute gay Americans. I agree with those who have termed this tour the "kill the gays" tour by NOM. To top this off, when counter-protesters show up, NOM cries a river and presents themselves as the victims. This is a video made by NOM to promote their talking point that their supporters are "bullied and intimidated" by LGBT rights advocates. They called it "shocking" on their front page. Take a look. This is their evidence of bullying and intimidation? "Protesters came armed with balloons and rainbow-colored umbrellas!" Oh noes, not﻿ balloons and umbrellas! How intimidating! Oh and didjah see? Some of them had rocks in their bottles that they made noise with! Rocks in a bottle that they didn't throw! This injustice shall not stand!! !When did right wingers become such crybabies? Oh that's right. They always were. By the way, there is the video of the Hispanic woman even being approached by protesters? They seem to have gotten everything on tape -- including the balloons and rainbow-colored umbrellas that the protesters came armed with, mind you -- except that. Hmm, why is that? In many parts of this country, gay Americans are literally fighting for our lives. We have legal discrimination. We have gay-bashing. We are harassed and intimidated everyday. We cannot marry the person we love. We cannot even openly serve the country we love in uniform. Gay Americans face the reality depicted in the extremist sign often. Yet, when we show up and stand up, we are "armed" with ... well, with balloons and umbrellas. NOM is the perfect example of a bully. When stood up to, they start crying and claiming victim-hood. For my money, NOM can shove their tours where the sun don't shine.